Hot on the heels of Asura’s recent article Considering Making A Stim Chip Mill?, Rylar has investigated in more detail setting up a Stim Chip economy. This article details the building setup and resource usage whilst maintaining details on profit. The conclusions are surprising! The lowest reasonable price for Neural Tissue, assuming a low trader income and a 2000/cr/tick owner income, is 145 cr/ton. The boost for low crime means each chip is about 158 credits cheaper to produce. Nice to have, but nothing exciting. A Stim Chip Mill needs a large capacity to be effective, much like a Nebula Plant. So, we’re going to assume ideal conditions. The Stim Chip Mills are level 10, the Neural Labs are level 8 and everything is located near to an NPC starbase on the FWE route. Proximity to a well stocked NPC starbase is important because only they can produce enough Animal Embryos to be considered effective. Even a Player owned starbase will be hard-pressed to make 3 Neural Labs tick. In a low crime cluster, a single level 10 Stim Chip Mill requires 2.6 level 8 Neural Labs. Realistically, Stim Chip Mills are harder to stock, so 2.5 Neural Labs per Stim Chip Mill is a good goal. This chain requires an NPC starbase approaching 180,000 population to produce enough embryos. Note that this base will consume 470 tons of food every 4 hours. With an ideal chain, low crime rate, low building income and low trade income, you can expect to sell chips for 3,800 credits each. Each Stim Chip gives about, 1/3rd the action points that drugs can provide (which sell for around 12,000 credits each). So, you can realistically expect 17,600 cr/day on Stim Chip sales. This does not include the build cost (or defense module cost) for each of the buildings in the chain – certainly for the high level buildings (which require large capacity) this will require a significant supply of Metal and Ore.
Clearly the Pardus programmers are bad at math. You should not pursue Stim Chip for profit. Even Space Farms and Nebula Plants will serve you better than Stim Chips. On the plus side, Stim Chips allow you to run a crime free cluster – which is priceless for Military Outpost quality. Regular visitors may have already discovered the Pardus Clock page on this website, and for those of you who use userscripts, you may have installed the Pardus Nav Menu Clock userscript in the past. I am pleased to introduce two extensions (one for Firefox and one for Chrome) that provide a large collection of universe independent and configurable Pardus Clocks for use in Pardus. Please note that these extensions are not designed to work alongside the Pardus Nav Menu Clock userscript. A lot of clocks are available to choose from – but it’s unlikely you will want to use them all at the same time (and indeed attempting to do so will require you have a wide screen to fit them all in). You can choose what clocks you want (for each of the universes you fly in). Do you know of a clock that is not present? Send me the details (Sparkle in Artemis) and I’ll update accordingly! Anyone with at least 10,000 experience points can build a Stim Chip Mill. What does it take to keep one running successfully? How does one select a practical location? What are the most difficult hurdles to overcome? Rylar wrote about Stim Chips when they were first introduced to Pardus, and now Asura has contributed more details on actually planning (and implementing) a Stim Chip chain. The bottleneck for a good location is Neural Matter. Yes, you need Exotic Matter (you will need to be within trade range of an Exotic Matter source) but a smaller trade ship (like a Babel or a T-Bird) can carry enough Exotic Matter to keep your Stim Chip Mill supplied for many production cycles. The same is true for Electronics – you need a supply, but not necessarily a high-volume supply. To keep a Level 2 Stim Chip Mill in production, you need 50/56/62 tons of Neural Matter per cycle (varying by the crime level of the cluster). If you have a slightly lower supply available in the sector, then you’ll occasionally spend a cycle without producing – but if you’re producing chips on, say, 9 out of 10 cycles, then that’s reasonably efficient. So you will need a Neural Lab somewhere very close to your Stim Chip Mill, close enough that you can haul Neural Matter from the Neural Lab to the Stim Chip Mill at sustainable AP cost. 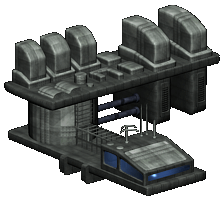 Note that a level 5 Neural Lab produces 48 tons per cycle; a level 6 Neural Lab produces 56 tons per cycle. A level 5 Neural Lab requires 31 tons of Animal Embryos per cycle whilst a level 6 Neural Lab requires 36 tons. Therefore, the Neural Lab should be close to an active Starbase, a Type G Planet, a Type I Planet, and/or a type R planet. An ideal location might include more than one Animal Embryo source – and consider the needs of any Space Farms also supported by that source (you don’t want to break an economy that is already in balance). A Neural Lab also needs Food, Water, Energy and Medicine – so you will need to source Medicines from somewhere as well. Since it requires you have at least 10,000 XP to build a Stim Chip Mill, you will already have at least three building slots. One for the Stim Chip Mill and one for a Neural Lab would be an ideal start. You might use your third slot to establish your own supply of Medicine or Electronics. If not, then perhaps you could build a Trade Outpost and sell your Stim Chips from there (whilst also using the Trade Outpost to store extra resources you need to support your other buildings). Other options might include a Military Outpost to help defend the location which includes your buildings. Perhaps before you build the Neural Lab and the Stim Chip Mill you might build an Asteroid Mine or Smelting Facility to generate the building materials you will use. I’m curious to learn about other third-slot synergies (please feed back to Asura or Sparkle in Artemis on this)! What Makes a Good Building Location? The upkeep requirements for a Stim Chip Mill vary based on the Crime Level of the cluster it is built in – so check the Crime Rate first (click the Statistics menu and then the Other tab). Narrow down a few sectors where there is currently an Animal Embryo supply that is currently going to waste; or where the Animal Embryo supply could (and would) increase if you become a local consumer. Consider faction and Alliance politics as well. Are there people who would actively interfere, by indirect means (such as buying up the materials you’ll need), or more direct means (such as attacking your ship and/or raiding your buildings)? Are there Military Outposts between you and your upkeep sources (and will you have permission to pass those Military Outposts)? Are there Military Outposts which would protect you from raiders? Are there supporters who would come to your defense if needed? Will your buildings affect which Alliance has sector dominance? Is the location often disrupted by Alliance conflicts or full-fledged Faction wars? Check for NPC spawn locations. If you are near Asteroids or Nebula Gas, would you mind running into cloaked NPCs when trading your buildings? 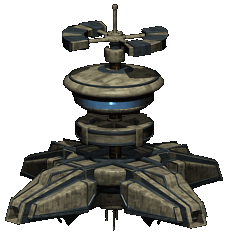 The Stim Chip Mill can be built on an energy field – are there Pirate NPC spawn locations nearby? Finally, send Asura in Artemis any feedback on what worked for you (and what didn’t), so that this article can be updated and become more useful! Comments Off on Considering Making A Stim Chip Mill? This userscript modifies the list showing the NPCs you have have killed on the Overiew Stats page. An image is added to the page for each of the NPCs in the list. The number of kills remaining until the next medal is shown as well as an image for each of the medals you have already gained. The list of NPCs is also re-ordered to show the NPCs with the least kills remaining until the next medal entry. For each of the NPCs you have not yet killed (and which counts towards a medal) is now shown at the bottom of the list of NPC kills and medals. On 14th September 2014 (the 10th anniversary of Pardus), a new NPC family was introduced. The Vyrex are an aggressive and expansive species that, like the Locusts, have the ability to take over a sector completely. Many pilots have reported intel on the Vyrex, and I have attempted to summarise these observations in this post. A lot of detailed information on the Vyrex family is available at Blacksun’s Pardus Resources as well as in the Pardus Forums. The first sign of infestation is a single Vyrex Assassin. This NPC moves and can travel via Wormholes to different sectors. After a period of time the Vyrex Assassin will evolve into a Vyrex Hatcher. There can only be one Vyrex Hatcher in a sector at any one time, and once they are present, they begin spawning Vyrex Larva (and the occasional Vyrex Assassin) until they are killed. Once the Vyrex Hatcher has been killed, a random Vyrex Assassin in the sector will evolve into a Vyrex Hatcher and the pattern will repeat. Vyrex Larva will only appear within 4 tiles of where the Vyrex Hatcher is located. The Vyrex Larva follow the same spawn times as Exocrabs – six times an hour (x:00, x:11, x:22, x:33, x:44, x:55). After a couple of days, the Vyrex Larva will mature to Vyrex Assassins – which will then spread the infection to adjacent sectors as the Vyrex Assassins move through Wormholes. If left long enough, Vyrex Assassins will eventually change in to Vyrex Stingers and eventually the Vyrex Stingers can change into the Vyrex Mauler. All members of the Vyrex family (except the Vyrex Hatcher) can stack underneath other NPCs – but they do not stack on the same tile as a Vyrex Hatcher. 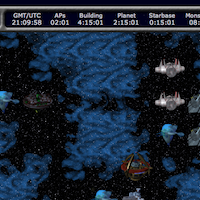 The best strategy to eradicate Vyrex from a sector is to weaken the Vyrex Hatcher first, then kill all Vyrex Assassins in the sector, then all Vyrex Larva in the 4 tiles adjacent to the Vyrex Hatcher and finally kill off the Vyrex Hatcher itself (note that all of the Vyrex family can cloak, so an entire sector sweep is required before killing the Vyrex Hatcher). On the day of the 10th anniversary of Pardus, some much anticipated updates to the Military Outpost finally arrived. A full explanation is included in the Pardus Manual, but I wanted to summarise some of the main points here. Military Outpost owners now have the ability to allow pilots who are under newbie protection (those that have played less than 50,000 action points) to pass through the Military Outpost – regardless of whether they would normally be allowed to. This option is enabled by default and is able to be configured via the Pass Settings option for the Military Outpost. If you have a Military Outpost and you do not want to grant passage to pilots under newbie protection, don’t forget to change your Pass settings disable passage for them by removing the checkbox beside the option “Allow passage to pilots new to space” (and don’t forget to them press the “Save” button). With the introduction of a Surveillance Grid, there is now a chance that pilots can pass a blocking Military Outpost – even though previously they would not have been granted passage. All ship types have been grouped into one of three categories to reflect their ship signature (clear, average, faint) and that signature is used to determine the chance of passing through a (normally blocking) Military Outpost. The higher you set the value of the Detection Grid Strength (via a sliding control on the Pass Settings screen) the lower the chance a ship is granted passage (if they would normally be blocked) and the more upkeep your Military Outpost will consume per tick. If you leave the Detection Grid Strength at zero, your Military Outpost will use the same upkeep as it always has (5t Fuel and 5t Energy) per tick. This setting will allow ships (that are normally blocked) with a clear signature to be blocked 75% of the time (so they have a 25% chance to pass), those with an average signature will be blocked 25% of the time and those with a faint signature will not be blocked at all. If you set the Detection Grid Strength to the maximum value of 20, your Military Outpost upkeep changes to require 15t Fuel, 15t Energy and 15t Radiation Cells per tick. This setting will block all ships (regardless of their signature) 100% of the time. The optimal setting (considering the upkeep cost versus the threat level from ships) for the Detection Grid Strength is value 15 requiring 15t Fuel, 15t Energy and 5t Radiation Cells per tick for upkeep. This prevents passage for ships with a clear and average signature 100% of the time whilst preventing passage for ships with a faint signature 75% of the time. The chance to block a ship is further modified based on the crime level for the cluster. Low Crime level increases the chance of blocking a ship by 10% whilst High Crime level reduces the chance by 5% and Critical Crime level reduces it by 10%. From the tables above it is obvious that the Crime Level in a cluster is now something that military planners need to take into consideration when planning defences. If you own a Starbase, you might be interested in how to manage the growth of squads… you may have noticed that the Pardus Manual is a little sparse on details. Each Starbase can ultimately have 12 squads totalling 100 fighters or bombers – but there are certain conditions that need to be met to achieve this maximum. When you have 1 ring on your Starbase you can grow up to 3 squads, each squad that “spawns” will be randomly a fighter or a bomber squad – and once spawned, the maximum the squad will grow to is 50. This growth occurs at 0313 GMT every 24 hours. To increase the number of squads and the amount of fighters or bombers in each squad, you need to increase the number of rings on your Starbase. Once a squad has been spawned it will not change (from fighter to bomber or from bomber to fighter), so it’s a good idea to “prune” unwanted squads at an early stage. You can’t control whether a fighter or bomber squad spawns (at 0313 GMT), but if a fighter spawns and you want a bomber squad instead – hire the fighter right away. The next time a squad spawns, it might be a bomber (if not, just hire the unwanted squad and try again until you get what you want). This is referred to “pruning” squads. Even though you need to have a minimum number of rings to spawn squads, you do not need to maintain the rings to keep the squads once they have spawned. One way to reach 12 squads of 100 fighters / bombers is to keep 4 rings until they are all grown to full size. This is definitely the easier route. Another way is to grow the Starbase to 4 rings and get all 12 squads to spawn – and then let the population drop to support 3 rings until all the squads are at 80… before returning to 4 rings again until the squads all grow to 100. This is more Food/Water efficient but does require more attention to your population level. This script works on the main navigation page and rearranges the content of the Other Ships box. The size of ships is reduced and re-flowed to show 2 columns (instead of a single column). This is particularly useful when you are on a tile with many other ships and allows you to see more pilots without scrolling. 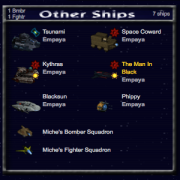 This script also counts the number of ships (including Fighter and Bomber squads) on your tile and summarizes them in the title of the Other Ships box. This script works on the main navigation page and rearranges the content of the Commands box. 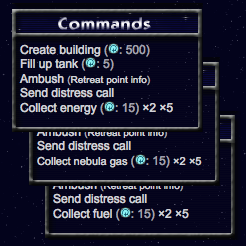 Whether you are on Energy, Fuel, Nebula Gas or Exotic Matter – the link that allows you to harvest the resource from the tile is moved to the bottom of the Commands box. It doesn’t have any effect when you are on Asteroids.